>>> moammar gadhafi continues his assault in the eastern part of the country, the territory he used to control. it's now in the hands of the rebels. he wants it back. again today gadhafi 's forces turned their fire on the town of brega . it's in the oil region and home to libya 's second largest oil facility. nbc's stephanie gosk traveled there today tonight . she's back in nearby benghazi. good evening. >> reporter: you hit on it. the fight right now is all about the oil. the opposition says they control 80% of libya 's oil resources and that they are going to use the money they earn from it to fund their cause. gadhafi is showing that he is determined not to let that happen. fighter jets bombed the rebels in the east again today. causing more fear than damage, but reminding people here how vulnerable they are. the opposition forces guarding brega 's oil terminal have no doubt gadhafi 's ground troops will also attack again soon. the battle for brega started wednesday morning. a fierce gunfight broke out in the sand dunes overlooking the mediterranean. by day's end, gadhafi 's fighters retreated, leaving 14 rebels dead and many more wounded. ahmed was there. when did you learn to shoot your gun? the faster of three with a master's degree in engineering proudly showed me his kalishnikov. but you're ready to fight? >> i'm ready to die. >> you're ready to die. >> yes, for my country. and for my people and for my kids. >> reporter: the fighters guarding brega gave us a rare firsthand look inside the massive oil facility here. first stop, a guest house riddled with machine gun fire. the oil industry relies on foreign expertise in libya . in this guesthouse in brega there were americans and british oil workers here during the attack. the rebels say they don't know what happened to them. the rest of the oil facility is completely shut down. the port, the tanks an the refinery. the opposition says they are resuming production of oil but production is just half the battle. they also have to export it. this is one of the most important port in libya and it's standing here virtually empty. hasn't exported oil in weeks. gadhafi says libya 's oil facilities are safe and secure. but in brega , the battle is far from over. even as the dead are mourned, many more fighters are rushing in to take their place. the opposition has rejected an offer to negotiate. leaders here in benghazi say what's the point in negotiating until gadhafi steps down. 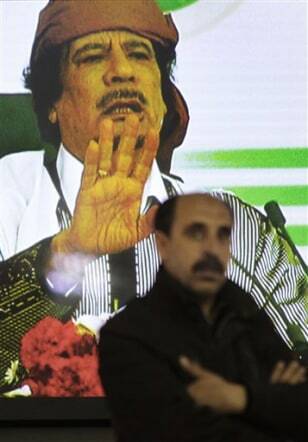 Security personnel stand guard as Libyan Leader Moammar Gadhafi is seen on a television screen, as he speaks in Tripoli, on Wednesday. Gadhafi vowed "We will fight until the last man and woman" and lashed out against Europe and the United States for their pressure on him to step down, warning that thousands of Libyans will die if U.S. and NATO forces intervene in the conflict.